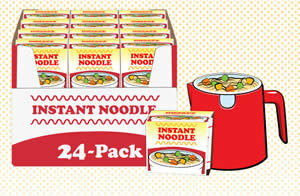 FREE Instant Noodles and a Good Cook Instant Noodle Maker! Starting at 3PM EST, today, Monday, August 18, Good Cook will be giving away a limited number of FREE 24 packs of Instant Noodles & a Good Cook Instant Noodle Maker. “Like” Good Cook on Facebook and be ready for the giveaway when it goes live at 3PM EST.